The story of the adoption of the official state silver rush ghost town began, in 2002, with a bill proposing an official state ghost town. Assembly Bill No. 1757, as introduced by Assemblyman Robert "Tim" Leslie, in January, 2002, proposed that the town of Bodie be named the official ghost town of California. There are hundreds of ghost towns in California and it was up to Mr. Leslie and his supporters to make the case that, out of the hundreds of other ghost towns in the state, Bodie should be designated as the official ghost town. For the most part the path was smooth, until the County of San Bernadino got into the act. There was concern, from the County of San Bernadino, that Calico Ghost Town, a popular tourist destination about 125 miles northeast of Los Angeles would be negatively impacted by the legislation. The concern was that official recognition of Bodie might create a competitive disadvantage for Calico when competing for state and federal grants. Representatives of the County of San Bernadino offered the following arguments in opposition to Assembly Bill No. 1757. 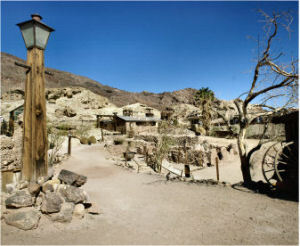 The County of San Bernardino, home to "Calico Ghost Town", a popular tourist destination, has expressed concern that if Bodie is designated as the official state ghost town, it may create a competitive disadvantage when rivaling for state and federal grants. Calico is located off I-15, north of Barstow. The county notes that "Calico, founded in 1881, could boast boomtown status, producing $86 million in silver, $45 million in borax, and a town population of 1,200 with 22 saloons, China Town, mercantile stores, and a red light district. Over 500 mines, including the legendary Silver King, Oriental and Bismarck were the engines that drove Calico's great wealth between the years of 1881 and 1907. Like most towns of the early West, when the price of silver dropped from $1.31 an ounce to $.63, Calico became a ghost of its former self. Today, Calico is one of the few remaining original and historical mining towns of the western United States. Calico is home of Tumbleweed Harris and the legendary 1885 Mail Dog Dorsey." Today, Calico operates as a county regional park, situated on 480 acres adjacent to federal lands administered by the State Bureau of Land Management. The county points out it would support this bill if it were amended to make Bodie "a" official state ghost town rather than "the" official ghost town. Assemblywoman Gloria Romero, who grew up in Barstow, held a sentimental attachment to Calico. As a little girl, Romero visited Calico often and she credited the attraction with giving her a sense of history. She argued for recognition of Calico Ghost Town. And so it was that the "Great Ghost Town Compromise of 2002," as Senator Debra Bowen, Marina del Rey, called it, was crafted in the California State Senate. Though Mr. Leslie was disappointed in the evident need for compromise, Assembly Bill No. 1757 was amended to make Bodie the "the official state gold rush ghost town" instead of the "official state ghost town." The "Great Ghost Town Compromise of 2002" paved the way for the recognition of Calico Ghost Town. In the summer of 2001, before the Bodie ghost town bill was introduced, a fire burned five buildings and a popcorn wagon to the ground in Calico Ghost Town. During the 2002 wrangling over the Bodie bill, Calico was being rebuilt. 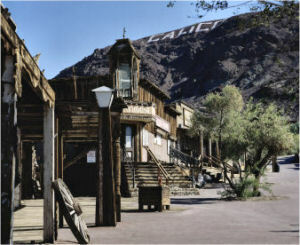 On July 19, 2005, Governor Arnold Schwarzenegger signed the legislation adopting Calico as the official state silver rush ghost town of California. Source: California State Legislature, California Law , (http://www.leginfo.ca.gov/calaw.html), February 10, 2008. Source: Calico Ghost Town, Press: Calico Ghost Town Rebuilt, 2002 , (http://www.calicotown.com/press/ribbon/), February 11, 2008. Source: 1Calico Ghost Town, Press: Calico hopes for official silver title , (http://www.calicotown.com/press/silver/), February 11, 2008. Calico Ghost Town: Calico Ghost Town, an Old West Mining Adventure, in California. Calico, California: Calico, California: From Wikipedia, the free encyclopedia . Calico - Revived From A Desert Grave: A travel site for the nostalgic and historic minded. CALICO, CALIFORNIA: Road Trip America entry from Megan Edwards, founder, editor, designer, writer, and book reviewer for RoadTrip America ®. Ghost Towns of California is a guidebook to the state's best boomtowns. Once thriving, these abandoned mining camps and pioneer villages still ring with history. Ghost town expert Philip Varney equips you with everything you need to know to explore these remnants of the past. Featured are color maps, driving and walking directions, town histories, touring recommendations, and stunning color photography of 70 sites, including the famous Bodie. Come see where it all started at the mother lode, and trace the great migration throughout the region. Visit the northern mines and the ghosts of San Francisco Bay, the Eastern Sierra, Death Valley, and the Mojave Desert. This is the essential guidebook to the glory days of the Old West!